View our diamond solitaire engagement rings here. Diamond solitaire engagement rings are beautiful without needing multiple diamonds. It is said that less is more, and that’s true with diamond solitaire engagement rings. Your engagement ring is the first step in your marriage proposal and needs to make a great impression. If you’re looking for an engagement ring that has the WOW factor, a solitaire ring may be of interest to you. We have many styles available on our site, so when you’re done reading, take time to view our selection. Meanwhile, you’ll also find some excellent examples included within this article. We’re ready to teach you all about diamond solitaire engagement rings. 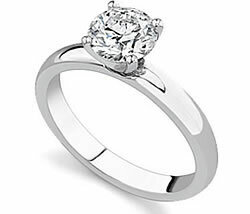 What are Diamond Solitaire Engagement Rings? Just like with the old card game, solitaire means “one.” In other words, a solitaire engagement ring contains only one diamond. There are no other diamonds or decorations on the band. The single diamond is the focal point of the ring and the diamond really stands out on it's own. That may sound boring, but it’s the exact opposite. Diamond solitaire engagement rings are simple, sophisticated, and elegant. For engagement rings, they have been a style favorite for decades. Diamond solitaire engagement rings come in all shapes and sizes. Any sense of style can be complimented with a solitaire ring. The solitaire diamond can be small and dainty, large and bold, or a combination of the two. It’s important to remember that with a solitaire ring all attention is focused on the diamond, so you must choose the diamond carefully. The diamond is the most important thing when choosing diamond solitaire engagement rings. You’ll want to choose the highest quality diamond you can afford. Nothing ruins a diamond solitaire engagement ring like a poor quality diamond. A good idea is to spend more on the diamond and then choose the band with the remaining funds. We have a variety of diamond solitaire engagement rings to fit any budget, so browse our selection to get an idea of price ranges. If you need help finding the perfect diamond within your budget, you can call us toll free at 1-877-877-4141 or use our online chat feature during business hours. Princess solitaire – Princess diamond solitaire engagement rings are square-shaped. If you choose this style, make sure your setting protects all corners of the diamond. The corners are fragile and prone to damage if not protected. Emerald solitaire – Emerald diamond solitaire engagement rings are rectangular in shape. The lines are longer than those presented by the Princess style. Marquise solitaire – Marquise diamond solitaire engagement rings are slender with tapered ends. The shape resembles that of an actual diamond. Oval solitaire – the Oval is self-explanatory. It’s not exactly round but instead is shaped like an oval or an elongated circle. If you like the round style but want something slightly different then the Oval is for you. Are you ready to choose your diamond solitaire engagement ring? That’s great, we can help. We’re sure you’ll find something to match your style and budget among our selection of diamond solitaire engagement rings. If you need help, call us toll free at 1-877-877-4141. We know how important this decision is for you.